Skinny fat (sarcopenic obesity) is when a senior has skinny weak muscles, but a lot of fat that makes up their body mass. Low muscle mass and strength is usually from aging and this is called sarcopenia. However, according to a new study published June 6, 2018, in the journal Clinical Interventions in Aging, the combination of both skinny muscle mass together with obesity can lead to cognitive decline and has a high risk for developing Alzheimer’s and dementia. The study was carried out by researchers at Florida Atlantic University’s Comprehensive Center for Brain Health in the Charles E. Schmidt College of Medicine. While obesity alone is bad for the body and while sarcopenia alone also has its down side, the combination of the two showed the worst results on cognitive function tests. The study focused on 353 participants with the average age of 69. Participants in the study were given tests such as the Montreal Cognitive Assessment and animal naming test, tests for muscle function such as grip strength and chair stands and measurements of body makeup (muscle mass, body mass index, percentage of body fat) and in fact those seniors who were both overweight and also had skinny muscles had the lowest results. This may mean that skinny fat seniors will be more prone to developing Alzheimer’s and dementia. Both obesity and sarcopenia alone were associated with lower performance on working memory, mental flexibility, self-control and orientation on seniors who were only obese or only had sarcopenia, but the lowest test results were in seniors that were obese and also had skinny muscles. The researchers suggest that losing weight and doing physical exercises to improve muscle strength and function might ward off the development of Alzheimer’s and dementia. There is an obesity epidemic now in the US, probably due to a more sedentary lifestyle and eating high calorie foods. In fact, many seniors have the habit of snacking on all kinds of junk foods while sitting in front of the television. According to the Centers for Disease Control and Prevention (CDC), more than 41% of seniors age 60 and over in the United States are obese. Obesity has been linked to a high risk for many other diseases such as high blood pressure, coronary heart disease, strokes, certain kinds of cancers and Type 2 diabetes. Diabetes can lead to even more diseased states like blindness and even amputations of the feet or legs. Diabetics are at a higher risk for developing neurodegenerative diseases like Parkinson’s disease and Alzheimer’s. Scientific researchers can make mice in their labs get diabetes just by feeding them the wrong diet and restricting the area for them to run around in, so that they cannot get enough physical exercise. Drinking alcoholic beverages, especially in excess also raises the risk for getting diabetes. 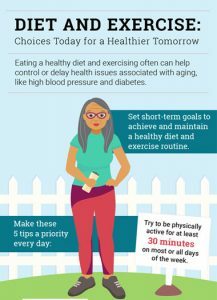 To learn more about prediabetes and diabetes in seniors see our blog from March 12, 2018. Since studies show no good can come from being overweight and having weak muscles, then it pays to take the time to lose weight and get more physical exercise in order to try to ward off chronic diseases and dementia. If you or your loved one is suffering from Alzheimer’s disease and you are considering a long-term solution at a skilled nursing facility then make sure to choose one that has a memory care unit like Royal Suites Healthcare and Rehabilitation in Galloway Township, New Jersey. To read more about memory care see our blog post from May 29, 2018. Royal Suites also offers respite care which is a great boon for caregivers who need a break. You can send your loved one there to be properly cared for while you are on a vacation. To read more about respite care see our blog from April 25, 2018.